Throughout history, and even today in much of the world, traditional herbal medicine has been the mainstay of medical practice. This long tradition of herbal wisdom has employed various herbs to speed fracture healing. Cissus quadrangularis is an herb with an ancient history of use in refined and effective herbal medicine traditions, and has long been hailed as an especially powerful natural treatment for a variety of indications. Cissus Quadrangularis is a natural herb grown in India that can speed-up the healing of your bone fractures, joints & tendon muscle. Since it s an Ayurvedic treatment, there are NO Side Effects and you can take it along with your regular medication. It is a highly effective treatment for curing bone fractures & muscle injuries through both analgesic and connective-tissue strengthening processes. 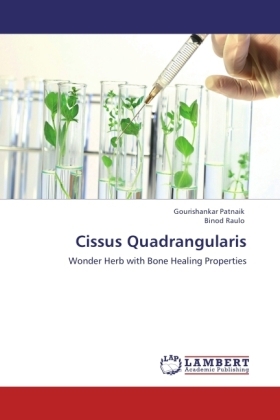 Cissus Quadrangularis has high amounts of vitamin C and antioxidants which directly boosts bone reformation and increases bone density.The authors are using this compound in their clinical practice and this treatise is a reflection of their experience in the usage of this wonder drug in the routine practise of fracture management.